Where is the shuttle pick-up location at EDI Airport? There is a dedicated pick-up zone conveniently located on the ground floor of the multi-story car park outside the terminal building. If you don’t want to drive to Edinburgh airport, we don’t blame you. In fact, our Edinburgh Airport Shuttle will take you straight there so you don’t even have to think about parking your car! We offer a professional service straight to Edinburgh airport from your front door. One of our friendly and experienced drivers will help you with your bags and you are ready to go. All you have to do is sit back, relax and enjoy the journey. Our Edinburgh Airport Shuttle is the fastest way to get to your terminal on time. Don’t book unreliable taxis and expensive private cars; we make sure every ride with the Edinburgh Airport Shuttle is affordable. If you like the sound of our Edinburgh Airport Shuttle, book today for fast transport when you need it the most. Edinburgh Airport is an airport in the Ingliston area of the City of Edinburgh, United Kingdom. It was the busiest airport in Scotland in 2018, handling over 14.3 million passengers. If you need a ride from Edinburgh Airport to your hotel or some other destination, rest easy, we will help you find the best one. There are many transportation options serving EDI Airport, such as Rideshare/Transportation Network Companies, Taxi Service, Car Hire, Chauffeur Service, and Public Transportation. We did the research and discovered all the information you need, so check below and find the best airport shuttle for you. Transportation Network Companies are very popular nowadays. Therefore, Edinburgh Airport authorized the following companies to service the airport with app-based transportation: Uber and Gett. Remember, £1 (one pound) equals $1.32. So, for example, £20 is $26.45. You can grab an Airport Taxi (black cab) from the taxi rank located on the ground floor of the multi-story car park, directly opposite the Terminal. No reservations are required. It seats up to 5 people, and the approximate fare to City Center is £25-30. There is also an Airport Private Hire available in the Taxi area that can drive to the city center for the same price as the taxi. If you want the freedom to explore Edinburgh at your own pace, you should definitely hire a car. Edinburgh Airport has a new combined car rental center. To find it, use the information pods in International and Domestic Arrivals. Edinburgh Airport offers one great chauffeur service - Edinburgh Executive Carriages. This service is available for all passengers arriving on a domestic flight with hand luggage. However, you have to make a reservation 24 hours in advance. At Edinburgh Airport, Executive Carriages operate a meet-and-greet service as standard where you will receive a warm and welcoming greeting at Arrivals. You can book online or call 0794 345 1544 or 0131 644 3034. Buses to Edinburgh and other local destinations stop on the terminal forecourt, outside the main entrance. Discover all buses and routes available from Edinburgh Airport below. This express bus service runs to Waverley Bridge. Buses run every 10 minutes. This service runs to Ocean Terminal in Leith between 04:55 and 00:00, seven days a week. This service runs to Cameron Toll. Buses run every 20-30 minutes. This service runs to Oxgangs and on to Fort Kinnaird. Buses run every 30 minutes. This service runs to the city center and on to Ocean Terminal in Leith between 00:45 and 04:15, seven nights a week. Buses run every 30 minutes. Edinburgh Gateway railway station is on the airport perimeter. It can be accessed from the terminal via a tram link which operates up to every 7 minutes. This station provides quick and easy rail connections to the city. Visit the airport’s website for additional information. 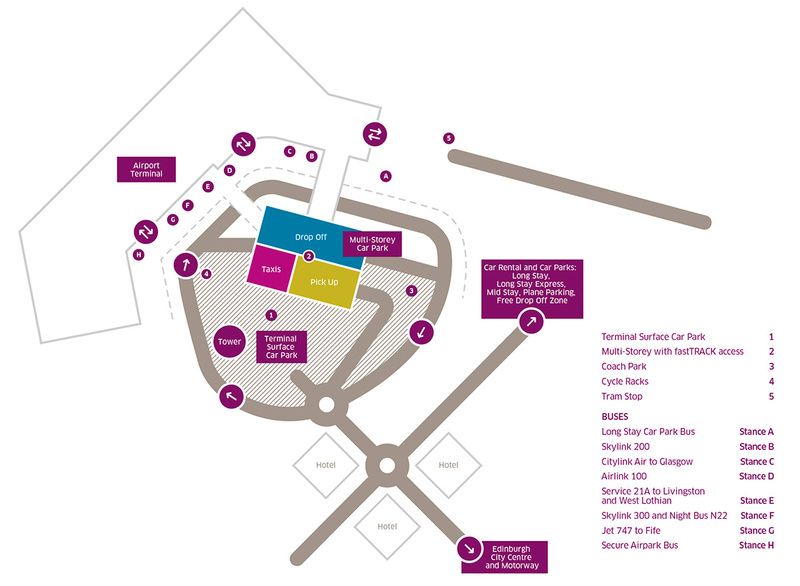 Check this map of Edinburgh Airport to find every transportation option’s area.